Falkirk progressed to the Scottish Cup semi-finals thanks to a tense win against 10-man Inverness. Lionel Djebi-Zadi was sent off for grappling with Carl Finnigan and the striker converted the resulting penalty kick on 30 minutes. 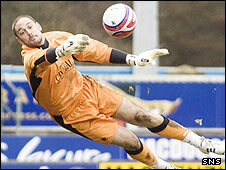 Bairns keeper Dani Mallo had earlier made a great flying save to keep out a header from Ross Tokely. A frantic closing period saw Mallo get fingertips to Dougie Imrie's shot and block bravely from Richie Foran. Both sides are struggling at the wrong end of the Scottish Premier League table and there was little love lost between them in a keenly contested affair, which threatened to boil over on a couple of occasions. Having gone ahead, the visitors were content to hit on the break and successfully soaked up all the Highlanders could throw at them. Falkirk created the first opening when Arnau Riera's header fell into the path of Steve Lovell but Ryan Esson raced out of his goal to thwart the striker. Ian Black responded with a dig from 20 yards, which Mallo had to get down smartly to push away as the home side began to string a few passes together. An inviting Imrie free kick found Foran at the back post but the Inverness midfielder could not readjust his feet in time and a golden chance from close range was gone. Mallo then made a fantastic save to claw away Tokely's looping header after 22 minutes. Inverness were looking the brighter side but gifted the visitors a goal on the half-hour mark. Djebi-Zadi was guilty of tugging on the shirt of Finnigan and the forward tumbled to the floor, leading to a red card for the French defender and a penalty award. Finnigan picked himself up and slammed home the spot-kick for his first goal of the season. Inverness manager Terry Butcher decided to reshuffle his depleted pack and brought on defender Richard Hastings for striker Eric Odhiambo. The home defence was cut to shreds from the opening of the second half but Patrick Cregg ballooned his 16-yard strike over the crossbar, with the goal at his mercy. Russell Duncan replied with a snap-shot on the half-volley that whistled narrowly over the top, while a rampaging run from Imrie was brought to a halt by a cluster of Bairns defenders. With the game deteriorating and the foul count increasing, Duncan was given another glimpse of goal but blazed his effort from 18 yards high and wide. Mallo gave the visiting fans a fright when he dropped a high ball at the feet of Tokely but the keeper's blushes were saved when the Caley Thistle defender scooped the loose ball harmlessly wide of goal. Butcher's side pressed furiously in the closing stages and Brian Kerr saw a thunderous strike bravely headed clear by Falkirk skipper Darren Barr before Mallo made impressive stops to deny Imrie and Foran. "I'm disappointed to go out of the cup, particularly with a home draw. I felt we could continue the good progress we had been making. "Obviously, the penalty and sending off changed the game. We had to regroup after going behind. We went 4-3-2 and gave a magnificent effort for the final 55 minutes. "We knew if we applied pressure we would get a chance but when it came the keeper made a great save from Richie Foran. "I can understand why the referee has given the penalty - we just have to get on with it, although I'm not too sure it was a clear goal-scoring opportunity." "This is first time in the club's history we've been in two national cup semi-finals in the same season. "There was plenty of spirit from my boys. You could see we are still up for the battle and hopefully this will give us the springboard to pick up wins in the SPL. "I felt we were the better side, especially in the first half. It was a certain penalty, although maybe the sending off was a bit harsh. "It wasn't great in the second half but credit to Inverness, they hemmed us in, and we stood up to it." Inverness CT: Esson, Tokely, Mihadjuks, Munro, Djebi-Zadi, Morais (Rooney 75), Duncan, Black (Kerr 58), Foran, Imrie, Odhiambo (Hastings 35). Subs Not Used: Fraser, McBain. Sent Off: Djebi-Zadi (30). Falkirk: Dani Mallo, Bullen, Pressley, Barr, Scobbie, Riera, Cregg, O'Brien, Finnigan (Aafjes 90), Lovell, Stewart. Subs Not Used: Olejnik, Holden, McBride, Lynch. Booked: Pressley, Barr, Dani Mallo.